There will be no Fox News debate for this year’s Democratic presidential primary contest. Democratic National Committee Chairman Tom Perez closed the door  to the right-wing network on Wednesday, telling The Washington Post that the party had rejected the network’s bid in light of the “inappropriate relationship” between Fox News and President Donald Trump that The New Yorker’s Jane Mayer documented in her damning new story . Perez’s statement brought a quick response  from Bill Sammon, Fox News’ senior vice president and Washington managing editor, who urged the DNC to “reconsider its decision to bar Chris Wallace, Bret Baier and Martha MacCallum, all of whom embody the ultimate journalistic integrity and professionalism,” from moderating a debate. Sammon’s comment is a well-worn talking point  familiar to anyone who has followed the network’s public relations campaigns over the years. Fox executives and flaks are constantly telling reporters  and advertisers  alike that the network simply has separate “news” and “opinion” sides like any other news outlet. 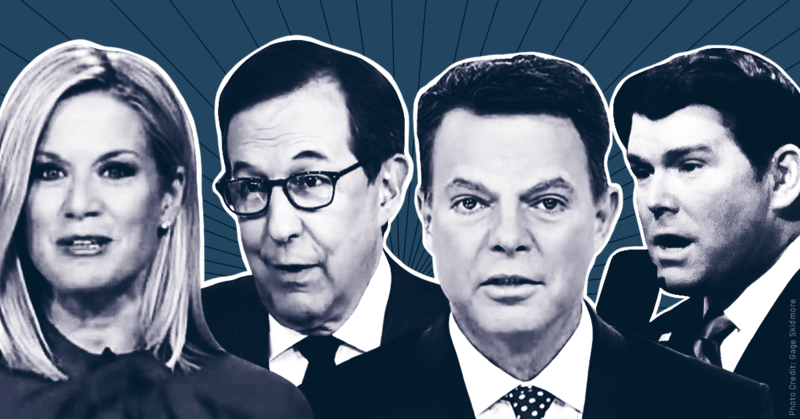 In their telling, it is unfair to hold the conspiracy theories and naked bigotry of Fox’s right-wing prime-time hosts against Wallace, Baier, MacCallum, Shep Smith, and the rest of the purportedly objective news team. This argument was never credible , but the network’s reinvention as state TV has rendered it utterly appalling. Everyone at Fox is complicit in what the network has become. That's because Fox is -- by design, and to its core -- a right-wing propaganda apparatus that relies on misinformation, disinformation, and outright bigotry to promote the conservative movement and Republican Party. That is its business model and its political project . It also employs some reporters, who have little influence over the bulk of the network’s operations. The reporters may at times criticize the unwillingness of other Fox employees to follow basic media ethics, but to no avail; as Mayer points out, “many Fox News reporters were angry, and provided critical anonymous quotes to the media” after Sean Hannity appeared on stage at a Trump political rally, but Fox supported Hannity nonetheless. The network’s pro-Trump talkers provide Fox with an audience, ratings, and political heft, and so its executives will choose the Hannitys over the Wallaces every time. Mayer highlights two examples of this phenomenon: Smith giving a monologue in which he “contradicted Trump’s scaremongering about immigrants,” and Wallace debunking one of the White House’s “wildly inaccurate” talking points during an interview with press secretary Sarah Sanders. Both instances garnered media attention  precisely because they cut against the right-wing lies and smears  typically seen on Fox programs with much bigger audiences. But these deviations from Fox’s norms are ultimately hollow. In effect, they are the new versions of former Fox host Megyn Kelly’s “Megyn moments,”  bolstering the credibility of the hosts and their network, but without any broader impact on the trajectory of Fox’s programming. Smith may tell his audience that there is no immigrant “invasion,” but that doesn’t stop the network’s prime-time lineup from assuring its much larger audiences that there is one. Wallace can give Trump aides a hard time in his interviews, but those exchanges end up going viral  everywhere except at Fox itself, which apparently prefers not to inform too many viewers about the administration’s false talking points. Baier and, of late, MacCallum, are often included in these discussions, but they largely went unmentioned by Mayer. I find their typical inclusion in these discussions suspect. Both tend to avoid publicly criticizing their colleagues, unlike Smith and Wallace, and produce far fewer of these viral moments. Baier’s biggest story in recent years was his quickly debunked and largely retracted report , days before the 2016 election, that the FBI was conducting a “very high priority” investigation of “possible pay-for-play interaction” between Hillary Clinton and the Clinton Foundation that would “likely” result in an indictment; more recently, he’s breached ethical norms  by golfing with Trump. Meanwhile, MacCallum is every bit as pure an ideologue  as anyone else on the network, using her show to claim that a border wall is “needed”  to stop the immigrant “invasion”  and declare that “both sides”  were at fault during the white nationalist rally in Charlottesville, VA, among  other  misdeeds . Instead, the Fox “news” team provides daily fodder for the network’s right-wing stars to opine about. Their role is to fill the network’s “news” hours with reports on whatever stories conservatives are panicking over that day -- Uranium One , Benghazi , migrant caravans , and the purported Justice Department conspiracy  against Trump among them. They provide incremental stories, often sourced to Republican legislators, that advance the narratives with fresh details for the “opinion”-side hosts to freak out about. Sammon himself is a key party to this dynamic. In 2010 and 2011, this top “news”-side figure became the subject of widespread criticism  after Media Matters produced a series of reports  showing how he had used his position to slant the network’s news coverage to the right -- including by claiming on air during the 2008 election that Barack Obama was advocating socialism, a charge he admitted he did not believe. Rather than firing Sammon for lying to its audience, Fox curtailed his on-air appearances but let him keep his senior job overseeing the network’s news coverage. Most recently, he was the point man  in Fox’s effort to get the Democratic National Committee to let the network host a presidential primary debate, an attempt that ended Wednesday when the DNC announced  that it would not partner with Fox in light of Mayer’s story. Mayer points to two cases in which Fox considered taking a big swing at a major scoop. It’s instructive to consider them as a pair. First, during the 2016 presidential campaign, a FoxNews.com reporter put together the story that Trump had had a sexual relationship with the adult film actress known as Stormy Daniels and that a payoff and nondisclosure agreement had been arranged to prevent her from detailing the affair. Second, in 2017, a second FoxNews.com reporter developed a story suggesting  that the murdered Democratic staffer Seth Rich, rather than Russian intelligence operatives, had stolen the DNC emails that were leaked during the campaign.